What do we term e-Government? 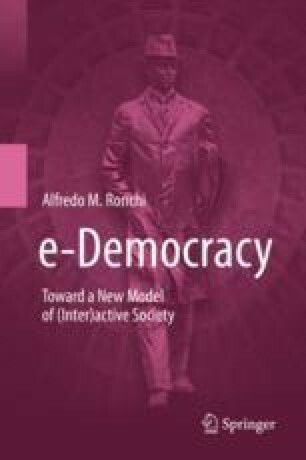 This chapter provides a comprehensive overview, subdivided by main classes, on the emerging scenario for everyday life in the e-Society. Main subjects are the different stages of e-Government evolution; connectivity as a public good, public access; multi-channel and cross channels access to the services. The scope of this chapter is to bridge the gap between technology and successful solutions analysing the different parameters influencing e-Government success or failure. This chapter like the whole book outlines the user/citizen perspective and desiderata. What do we term e-Government? ; Stages of e-Government Evolution; Connectivity as a public good; Public Access; Multi Channel and cross channels access to the services. Different parameters influencing e-Government success or failure; Interoperability of systems. Privacy and Personal Data Management. How to rank ICT development, e-Government readiness, and measure performance; ICT indexes: DAI, ICT-OI, DOI, IDI. Benchmarking e-Government and e-Government Readiness Index. Unsuccessful stories: some reasons why; e-Government in a long-term perspective.